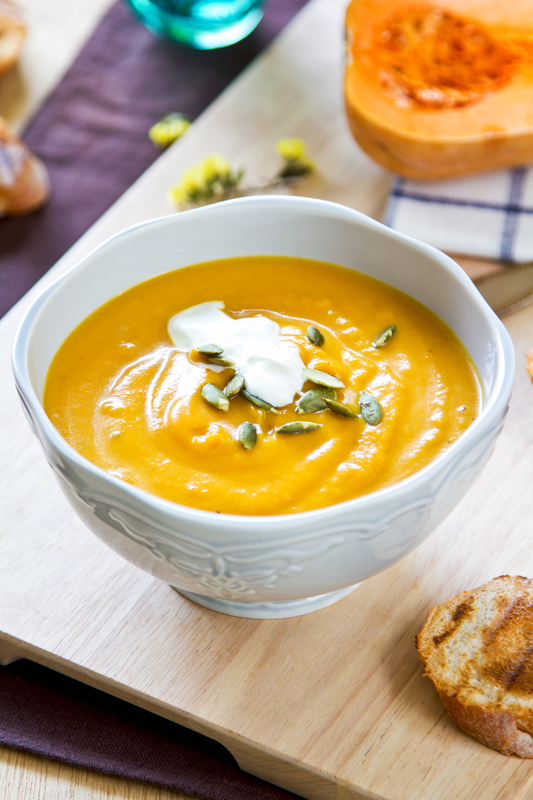 Butternut squash and onion are roasted in the oven, seasoned with salt and pepper and pureed into a delicious soup. Preheat the oven to 425 degrees Peel the butternut squash, remove seeds and cut into about 1 1/2 inch cubes. Peel the onion and chop into large pieces. Line a baking sheet with foil and oil the foil. Spread the squash pieces on one side of pan and the onion on the other side of pan. Drizzle the oil on the vegetables and bake for 45 minutes or until tender, tossing after 20 minutes or so. Remove from oven and pour into a pot. Using a hand held blender, add about 2 cups boiling water and puree until smooth. Adjust final seasoning with salt and pepper. Consistency may also be adjusted with additional boiling water. Garnish with plain yogurt or sour cream..